“Suppose just for a moment that the miracle of genesis really did occur on Mars… then evidence for how it happened may still be there, a story in the rocks waiting to be read.” – Steve Squyres. The tale of Spirit and Opportunity, NASA’s Mars Exploration Rovers, is surely one of the most gripping adventures in scientific history. 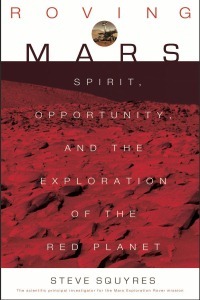 But what did it take for Steve Squyres and his team of scientists and engineers to put Spirit and Opportunity on Mars? The short answer? Two decades of planning and preparation, the toil of hundreds of dedicated scientists and engineers spread over the earth, numerous threats of cancellation, several potentially catastrophic design defects, and a breakneck race to get the Rovers off the launch pad that almost ended in disaster. In Roving Mars, you join Steve Squyres as he charts every change of fortune in the long road to Mars in a beautifully florid and jargon-free prose. You experience first hand what it feels like to achieve a life-long dream on such a cosmic scale. However, even after his twenty year and 60 million km journey, the successful landing of his Rovers was only the beginning of the real adventure. For the second half of Roving Mars, the reader is entreated to Squyres’ diary of the exploration of the red planet, including the harrowing account of the near disaster when Spirit suddenly went dead eighteen days after landing. Rescuing the Rover from the brink of oblivion, the team send Spirit racing across the geologically dull basalt-littered plains of Gusev Crater towards the distant Columbia Hills, a journey impossibly longer than her designers had ever dreamed. Meanwhile, on the other side of the planet, Opportunity lands safely and promptly makes a discovery that will shake the scientific community to its core…. Roving Mars is a gripping yarn of teamwork, adversity and the exploration of another world, which you will like all the more because it is true. Forget Picard, Kirk, or Buck Rogers; give me Squyres any day.